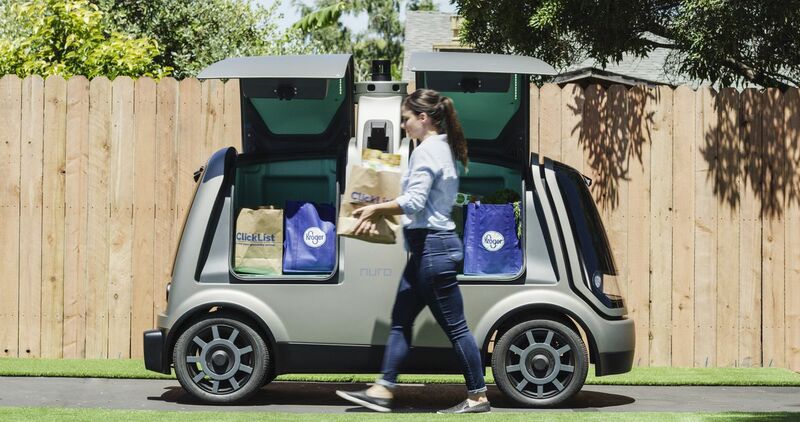 Kroger, the nation’s largest supermarket chain, is teaming up with Nuro, a two-year-company started by two veterans of Google’s self-driving car team, to launch a fully driverless delivery service, the two companies announced Thursday. A pilot will be rolled out to a yet-to-be-announced city later this fall. To start out, Nuro will use a fleet of self-driving test vehicles with human safety drivers to make deliveries for Kroger’s grocery stores. Customers can track and interact with the vehicles via a Nuro app or Kroger’s pre-existing online delivery platform. But if Nuro’s human test drivers don’t get out to help you, don’t be mad because in our driverless future, we all need to pitch in and unload our own groceries. This is to prepare us for when Nuro deploys its driverless R1 vehicles for delivery runs. First unveiled in January when the company came out of stealth, the R1 is thinner and shorter than normal vehicles, but larger than some of the delivery robots that we’ve seen in beta testing so far. The R1, which is not its final name, looks like a toaster on wheels, or an oversized, intelligent lunchbox covered in cameras, radar, and laser sensors. A lot of the specifics of the partnership are still being hammered out, but it’s clear that this is a big win for Nuro. Not only will it allow the startup to begin mapping dozens of cities and towns, it also instantly propels this unknown company into the wider world of people who shop at Kroger. The chain has 2,800 stores in 35 states, and serves around 9 million customers every day. Nearly three-quarters of those customers have access or use Kroger’s delivery services, according to Yael Cosset, the company’s chief digital officer. Nuro emerged from stealth last January with two big names in self-driving and AI, Ferguson and Jiajun Zhu, at the helm. Zhu was one of the founding engineers of Google’s self-driving team, while Ferguson was a leading software engineer on the team. Right now, the company is using a fleet of six self-driving cars to collect data and optimize routes, which then gets fed into its prototype R1 vehicles. Nuro has been testing its regular self-driving cars — Toyota Prius and Nissan Leaf vehicles with the company’s AV tech bolted on — on public roads, but it will need sign-off from the US National Highway Traffic Safety Administration before it can operate in states where regulation prohibits completely human-free driving. Cosset they would likely avoid launching their service in those states and cities altogether. The converging trends of robotics, self-driving cars, and e-commerce are leading to an explosion of interest in the last-mile delivery challenge. Consumers are ordering more items online than ever before, and there is a growing expectation for shorter and shorter delivery windows. A recent study by McKinsey put the global price tag of last-mile delivery every year at around $86 billion, with staggering year-over-year growth rates. Nuro is still tweaking its user experience, but for now it will go something like this: customers can place an order through Kroger’s online delivery portal or using Nuro’s forthcoming app. 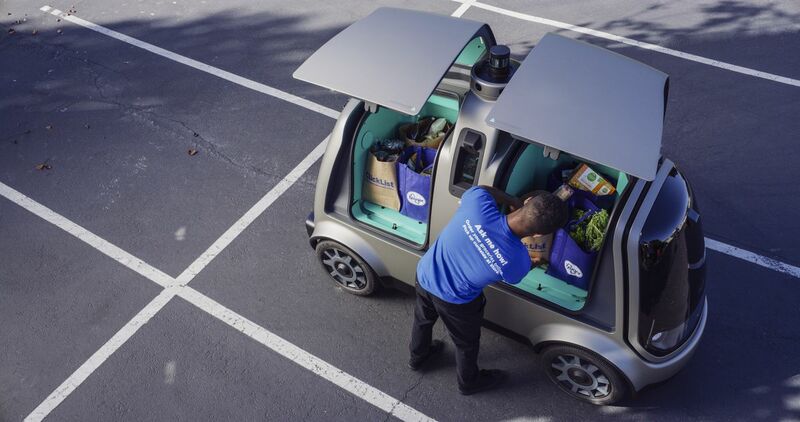 Kroger workers will load the items into Nuro’s temperature-controlled compartments, at which point the vehicle will drive autonomously to its destination. Customers can track the vehicle throughout the trip using the app, and once it arrives, will need to meet the vehicle at the curb or in their driveway — in other words, no more door-to-door service. They can use either a PIN code or some other verification system to retrieve their delivery. Nuro was reportedly working on a facial recognition system, but has since tabled that. Cosset said biometric scans could still play a role. Cosset said that Nuro’s vehicles need to be able to operate in dense environments, as well as heavy traffic and all kinds of weather conditions. For Nuro, that kind of real-world testing is both highly attractive — especially from a data collection perspective — and highly risky. Unlike a host of other AV startups, Nuro has been testing mostly at an abandoned lot in Sacramento, and only for a couple of years. Alphabet’s self-driving unit Waymo has been testing, mapping, and laying the groundwork for its commercial self-driving taxi service for three times as long, and its technology is inarguably more mature. But so far, no one is making any real money off driverless technology. We’re on the cusp of the launch of dozens of tests and pilots that will brings exponentially more people in real contact with these vehicles. And right next to the Ubers and Waymos and Teslas will be more unknown players. Like Nuro.